The latest addition to Sapphire's Pure Black family of motherboards is the Sapphire Pure Black FX990. As you may have gleaned from the name, it supports AMD's latest high-end FX990 chipset. This is joined on the board by AMD's SB950 Southbridge and an AM3+ socket to support AMD's Bulldozer CPUs. 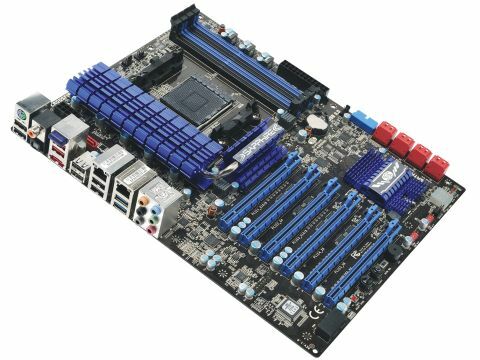 Sapphire may not be the first company that comes to mind when you're thinking about motherboards, but it has still managed to produce boards with the latest mobo tech at regular intervals over the last year. So, despite not having the same breadth to its range as its competitors, it has managed to have something for all platforms. Built to the usual high quality we've come to expect from Sapphire, the well laid out board uses top-end components throughout, including the multi-phased power design using Sapphire's own design Diamond Black chokes and solid capacitors. The Sapphire Pure Black FX990 also introduces something new on the Bios side of things - Sapphire's new UEFI QBios. Talking of the Bios, the board comes with dual switchable Bios's (via a two-way switch on the board), which is handy should you fry one with some over-zealous overclocking.